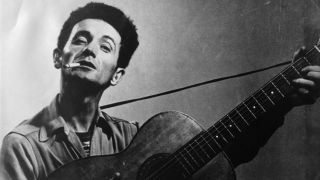 ACOUSTIC WEEK: Woody Guthrie was probably the first folk hero in America. He is famously quoted as saying about his playing that, "If you play more than two chords, you're showing off." This was typical of the man responsible for timeless and classic folk standards such as This Land Is Your Land and The Grand Coulee Dam. His songs, based on his own experiences, ranged from children's sing-alongs and romantic love songs to working- class anthems and anti-fascist protests. His voice had a soulful, nasal twang to it and would later be imitated by almost everyone who picked up an acoustic guitar. Guthrie was, without a doubt, the most influential folk singer- songwriter of the twentieth century. Woody was much admired by the young Bob Dylan. A significant portion of Bob's early work is clearly influenced by the style and spirit of Woody, both as a singer and guitarist. 1962's Blowin' In The Wind was effectively the archetypal finger-pointing protest song. Although he started out in that way, Dylan quickly developed his own unique lyrical and musical talent that set him apart from almost everyone else in the sixties. Simply put, Bob Dylan was the single most influential songwriter of the sixties generation. Just listen to A Hard Rain's Gonna Fall, also from 1962, which presented the listener with a new kind of folk ballad - one that was as prophetic as it was visionary and apocalyptic, and largely inspired by the poetry of William Blake. It is a song that is as valid today as it was back then. Among his contemporaries in the US were Joan Baez and Joni Mitchell. England also had some major folk figures. A young Bert Jansch was quickly earning himself a strong following in London with his ground-breaking virtuoso acoustic guitar playing, which was as elaborate as it was refined. His songwriting was dark and deeply affecting, and his voice passionate. His eponymous debut album, released in 1965, caused a sensation at the time for his innovative playing and powerful songs. It proved to be hugely influential and is still cited today by legions of guitar players as a major influence. Jansch would later expand his innovative arrangements of full-length folk ballads, which he would explore even further with Pentangle, a band he formed with fellow guitarist John Renbourn. Pentangle went on to make six albums and became one of the first major acoustic groups to enjoy a significant amount of commercial success, playing prestigious venues such as the Royal Albert Hall in London and Carnegie Hall in New York. Martin Carthy, who was a contemporary of Jansch's, was another influential folk musician on the scene. He began his career in the English folk revival of the early 1960s and he saw the acoustic guitar as an accompanying instrument. Over the years he would develop the scope of his own instrument and technique as well as adding finger-picking and percussive American styles he had learned whilst playing skiffle in the fifties. Later on in the sixties came Ralph McTell, a singer songwriter of substance. His prolific songwriting was matched by his virtuosity on the guitar. Ralph made his debut in 1968 with the album Eight Frames A Second, and 1974's Streets Of London not only earned him an Ivor Novello Award, it also made him a household name. His songs have been covered by a variety of international artists and in 2002 he was presented with the prestigious Lifetime Achievement Award at the BBC Radio 2 Folk Awards. Don McLean took folk to another level for a while, with his best selling American Pie album and single. His inspiration was drawn from simple, beautiful songs. American Pie was a brilliant song, a metaphor for the death and rebirth of rock. The album sold extremely well on the strength of the title track, and remained in the charts for 48 weeks, achieving 'gold' status in 1972. A fine release rooted in folk and deservedly a classic. While a lot of the 'original' folk musicians are still touring and recording, it is important not to overlook new blood. Talented acoustic-oriented artists like Suzanne Vega, Ani DiFranco, Patty Larkin, Tracy Chapman, Dar Williams, John Wesley Harding, Shawn Colvin and The Roches made their mark in the eighties and nineties, carrying the torch forward. Woody Guthrie writes This Land Is Your Land, while hitch-hiking his way to New York City in the bitter cold of winter. One of the most popular and influential American folk songs of the 20th century. Bob Dylan releases Blowin' In The Wind, the archetypal finger-pointing protest song, and popularises the genre. In Britain Donovan, along with peaked cap, denims, and motto-bearing acoustic guitar, is hailed as England's answer to Bob Dylan, and releases Catch The Wind. Bert Jansch releases his first album and launches a new style of guitar virtuoso folk music. Ralph McTell releases his first album and continues the folk trend set by the likes of Jansch and Carthy. The first folk 'supergroup' forms as Pentangle, fronted by guitarists Bert Jansch and John Renbourn. Joni Mitchell sets new standards for acoustic songwriting with the release of her Blue album. Auspicious debut for Paul Simon's post-Garfunkel solo career. Subtle and diverse. US folk singer-songwriter Suzanne Vega releases first album to much critical applause. The single Marlene On The Wall was a huge hit in Britain. Tracy Chapman's eponymous debut released to worldwide acclaim. Her songs about liberal politics were hugely influential on American college campuses in the late '80s. Ani DiFranco, a 'folkie' in punk's clothing, emerges as one of the most influential and inspirational cult heroines of the 1990s. David Gray, part of the new breed of folk-pop singer-songwriters releases his first huge seller, White Ladder. Damien Rice releases his acoustic home recorded masterpiece, O.